1. 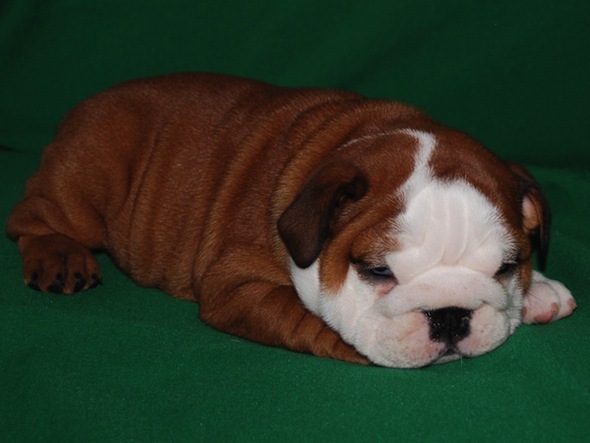 You place deposit on one of the purebred English Bulldog puppy of your choice and let us know when and how you want to get this puppy picked up. 2 We process the paperwork and get all needed document for shipping/delivery. 3. 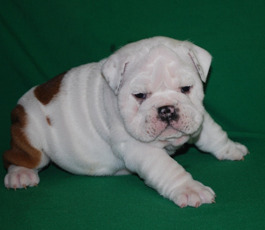 You pick the bully up from our home, or we will ship the puppy to the airport of your choice. 4. Once you get your English Bulldog puppy you take him/her to the veterinary of your choice and fax us a Vet Examination Form up form to activate the warranty. 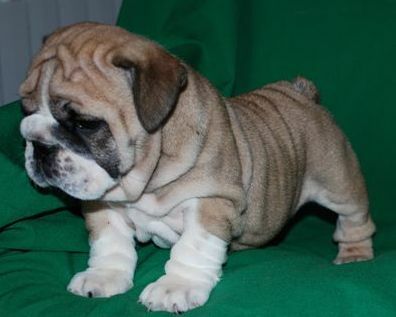 When you find an English Bulldog puppy you like on ELITEBULLY.COM you need to place a $300 deposit with your credit or debit card to reserve the puppy by clicking on BUY NOW Button next to the puppy you like. Once the deposit is done please click on CONTACT US link on the top of the site and fill out the form. We will need you to provide the name and address of the new owner you would like to put on the paperwork, contact phone numbers, and e-mail address. Please notify us if you will need an Official Pedigree papers (small extra fee may apply), and when and how you are planning to get your new bulldog puppy from us. If you will be driving in, please let us know the date and the time, we will give the address to our home. If you will need us to get the puppy shipped to you, please let us know the name and 3 letters code for the biggest airport close to you. It is also recommended to call us at (817) 247-8916 to make sure we got your info. 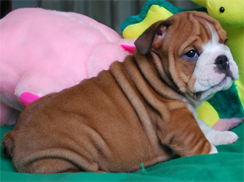 Once we get your info and deposit to reserve featured English Bulldog puppy we will prepare all the paperwork and e-mail you the PDF copy of Contract, Warranty Info, Health Records, Veterinary Examination Form for your puppy to the e-mail you provided. That way you can make sure we got all of your info correct. We will contact you and arrange the delivery time if you choose to come and pick the puppy up directly from our home. We will sign all the documents and process the payment of the balance once you will get here. 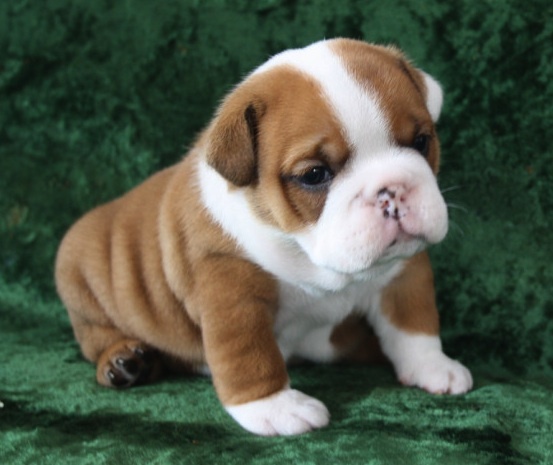 If the English bulldog puppy will need to be delivered to you, we will take the puppy to the Veterinary and get a Health Certificate required to admit the puppy on the plane. We will e-mail you the invoice for the difference through pay pal and make flight arrangements with one of the major airlines to deliver the puppy to the airport of your choice. We will keep you informed throughout the whole process and will do everything possible to make sure you get the best experience ever. IMPORTANT! 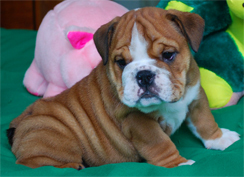 - Before you adopt an English Bulldog puppy from us you must understand our policies regarding Deposits, Payment, Shipping and Registration of our puppies. When you place a deposit it is assumed that you have read and understand the information provided ! No refunds or waivers will be given to you because you claim to have not read this info or suddenly changed your mind! WE CHANGED THE WAY WE DO BUSINESS!!! We no longer list our puppies on our website and than spend lots of money to advertise them. 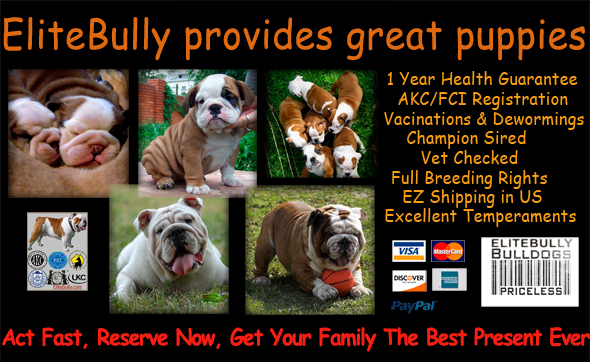 Now we only deal with qualified breeders, return customers and referrals. This strategy allows us to keep the price low while concentrate on providing fewer litters with unique elite quality puppies. Please e-mail us with what characteristics you are looking in a puppy (gender, color combination...) and we will gladly send you pictures of the puppies we have available at that time or let you know about upcoming litters. Washington, Houston, Dallas, New York, Newark, Toronto and Vancouver. Call 817 247-8916 or email with ??? Thank you Patty and Bill. Barbie now lives in IN to with another Elitebully 2+ Year old bulldog that came from Elitebully. Laurance now lives in San Antonio TX. His family have been looking for the right puppy on Elitebully.com for over 8 month and are now very excited to have him as a part of the family. Rocco now lives in Alabama. His whole family came to get him from us in Dallas. They are extreamly happy to have him. Thank you Joel for your bzns and trust. Rex now lives in AR. His Father has been looking for him for over a year on our website and now is extreamly excited to have Rex as a part of his family. We are here to help; therefore, contact us with any questions you may have. Just please keep in mind that we are in TX, on GMT central time. Do not wait until the last moment to place a deposit, secure your baby early before someone else would.